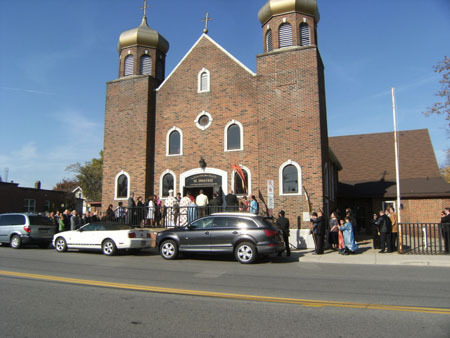 Windsor, Ontario - Our holy Church, St. Demetrius the Great Martyr in Windsor, celebrated its Krsna Slava, our patron Saint. 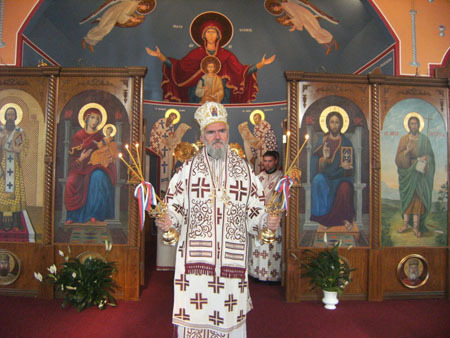 His Grace Bishop Georgije of Canada officiated at the Holy Hierarchical Divine Liturgy with the concelebration of the clergy. 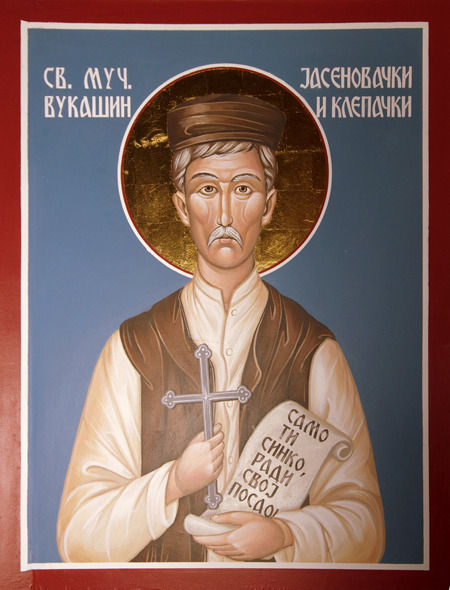 This is a great day for us Christians, for meeting us in our protector before the Lord, St. Demetrius, who bears the blessings of the Lord and prays for us before the God's holy Throne. 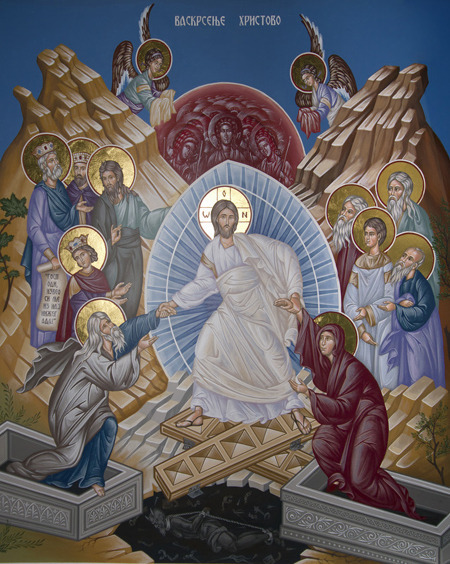 It is beautiful to see a filled church with our honorable and pious people who see this Church as the house of prayer where their souls are transfigured, and also as their own home where the Heavenly Kingdom is prefigured through the Divine Liturgy. 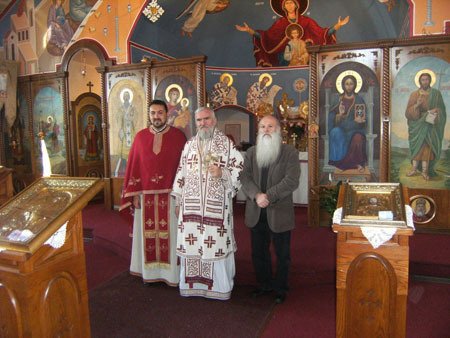 That our joy might be more complete, it is an honor to share the new with all of our people of good will, that we have on this day blessed the fresco work in our church, which began almost three years ago by iconographer Gligor Stefanov. Every earthly deed, every work, every effort, everything that we might be blessed by the name of the Lord Jesus Christ and being blessed that we might collect the rewarding and thankful fruits. Let us not forget, dear brothers and sisters, that we have received everything as a gift from the Lord Creator of all. 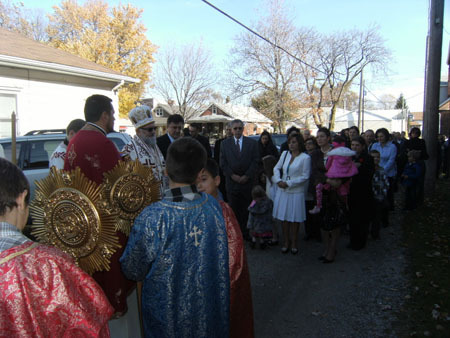 Life is a gift and for a gift we give thanks and for this reason serve the Divine Liturgy the service of thanksgiving to God. 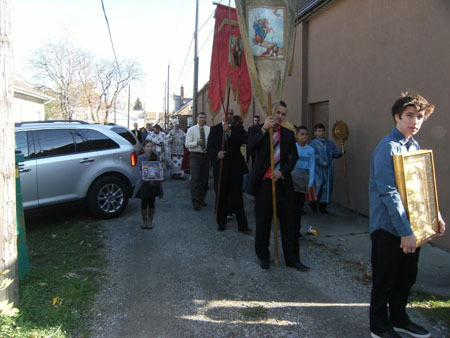 According to the words of the Holy Gospels, that each good deed brings with it its fruit in its season, for this selfless commitment and organizing the work on the occasion of the fresco work on the church, we are proud of all of our parishioners and members of St. Demetrius, especially our brothers who tirelessly work on the church board, under the presidency of Zarko Vucinic. This Church, as well as all of our church, greet all hard working people, offering them love and spiritual support. 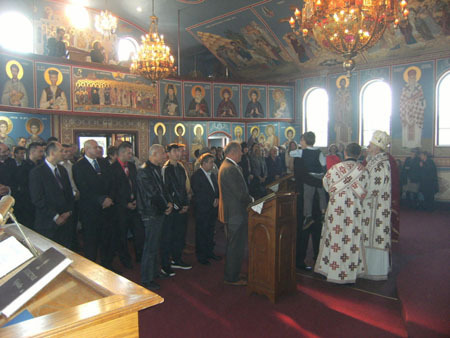 Just as a newborn child embraces its mother, so too do we, dear brothers and sisters, come and fill our churches for they open their doors to us and fill us with God's living word. For this reason it is important, that we think with our hearts, live our lives according to our hearts, using, of course, our reason and mind but that they be at service to our hearts, not that our hearts suffer and wait when will it be freed and when with God's seed fall on it. 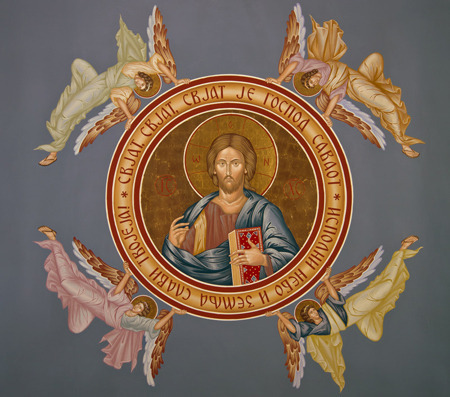 May our holy Church shine with the images of God's holy righteous ones, just as before the Thone of the Living God in the Heavenly Kingdom, for they continuously pray for us and love all people, the work of God's hands. 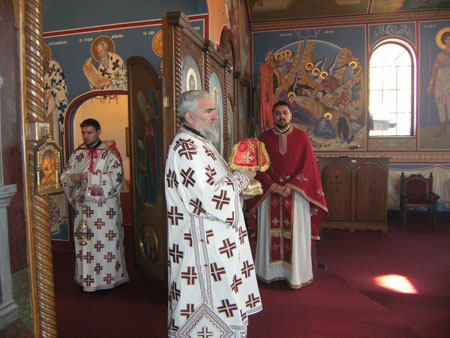 In the first place I wish to thank our Bishop Georgije, who apart from his many obligations found the time to share in this joy with us. I also thank my brother priests from our God protected diocese of Canada. 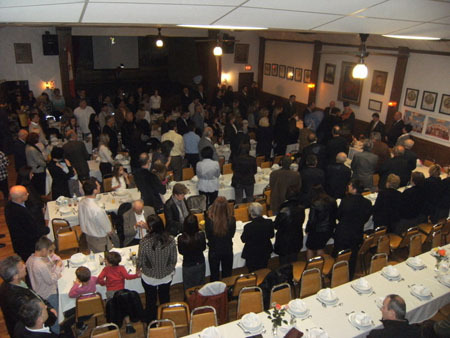 I am also grateful to all of our guests, and all present who with their presence have enhanced our Slava as well as this year's kumovi Marko Krdija and his family as well as the kumovi for the frescoes Zeljko Bajic and his family. 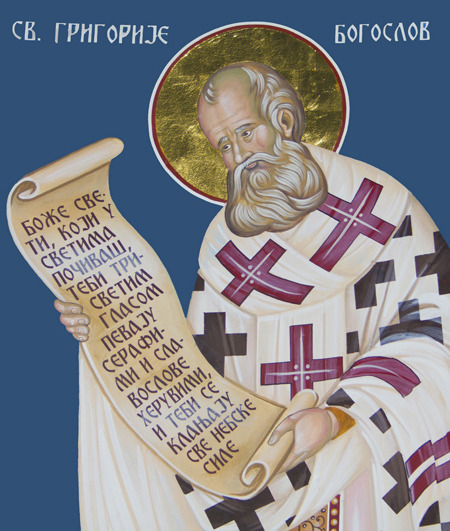 May St. Demetrius bless us and watch over us from all earthly temptations in all the days of our live. Amen!